Evaluation of materials indispensable for lithium-ion batteries. For lithium-ion batteries and fuel cells, we use materials ,called ion conductor, that move ions in the crystal. We aim to clarify what kind of ionic conductor can accelerate the movement of ions, but it is extremely difficult to measure the velocity and distribution of ions traveling in the crystal. 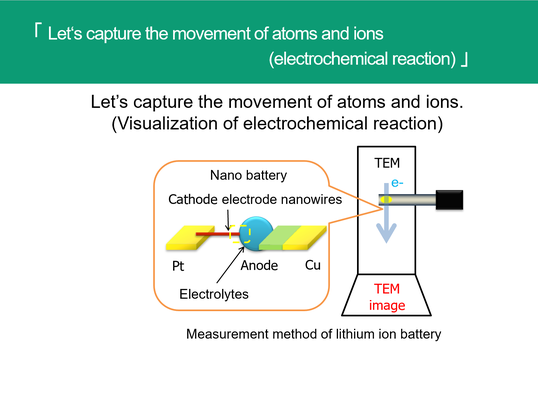 In our laboratory, we are developing a device and observation method to visualize the state of ions moving in the ion conductor, and try to clarify the characteristics of the ion conductor. 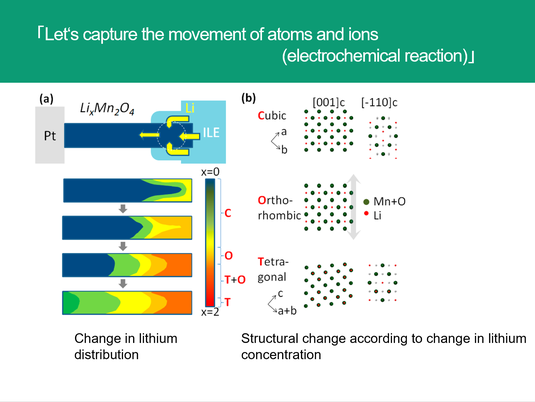 The figure on the left side shows how the distribution of lithium in the lithium manganate (LiMn 204) crystal used as the Cathode material of the lithium ion battery varies depending on the discharge process (during use of the battery). In lithium-ion battery, lithium ions (Li +) in the Cathode material are forcibly moved through the electrolyte to the Anode material during charging. At this time, when one positive charge of lithium ion moves, since the charge needs to be neutral, one negative charge (electron) moves to the Anode through the wiring. By this, one electron is stored in the Anode. When using a battery, we will use the force that lithium ions try to return from the Anode to the Cathode. When lithium returns to the Cathode, electrons move from the Anode to the Cathoude through the wiring with a voltage difference according to the force. Using this electronic movement, we can use the electronic devices , smartphone etc.